Breathing is something we do all day, every day in order to stay alive. But how often do you stop to think about how your breathing affects your well-being and state of mind? When you are feeling stressed or angry, the body’s natural reaction is that of flight or fight, not relax and breathe. Many people respond to stress by lashing out at others, sleeping, self-medicating with drugs and alcohol, or other alternatives that do little to truly combat stress effectively. In order to meaningfully reduce stress, you need to tap into a state of true relaxation where the body physically responds to lower heart rate and blood pressure and increased levels of nitric oxide. One of the best ways to experience this physical reduction in stress is through controlled breathing. 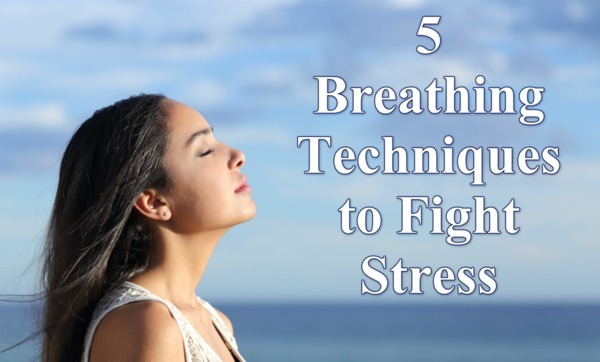 Here are five breathing techniques that will help you to fight stress. Equal breathing is a quick and easy way to reduce stress and anxiety. This beginner technique is based on consciously taking deep, regular breaths to calm the body as well as focus the mind. Once you begin to relax, stress hormones are naturally reduced. Begin by sitting in a chair or on the floor in a cross-legged position. It may help to sit on a meditation cushion, pillow, or folded blanket for comfort. Close your eyes and allow yourself to become aware of your breathing for a few breaths. When you are ready, begin with an inhale and slowly count to four, pause, then count to four again as you exhale. Pause between breaths and repeat until you feel relaxed. The goal is to equalize your breathing with your inhales and exhales. As your comfort level increases, you can extend the length of each breath as long as the inhales and exhales are held for the same amount of time. Abdominal breathing is a deep breathing exercise that focuses on breathing with the diaphragm. This engages the entire body and is believed to increase the supply of oxygen to your brain and promotes a state of calmness. From a seated or standing position, start by placing one hand on your chest and the other on the stomach directly below your rib cage. Close your eyes, then take a slow, deep inhale of air and let it flow into your lungs. You should feel your lungs expanding as you focus on inflating your diaphragm. You will notice your chest moving slightly, while your other hand will feel your stomach rising. When you’ve inhaled fully, pause for a moment, purse your lips, then exhale fully through your mouth. As you exhale, relax your entire body. Your exhale should last twice as long as your inhale. You should aim for six to ten deep, slow breaths per minute and repeat for a minimum of ten minutes each day. This should result in a reduction in heart rate and blood pressure. Bellows breathing gets its name from its similarity to bellows used to fan a fire. It is a popular yoga breathing technique thought to raise energy levels and increase alertness. This breathing exercise is best practiced from a sitting position. Sit up tall, relax your shoulders, and take a few deep breaths in and out from your nose. As you begin, start to increase the rate at which you inhale and exhale. Keep your mouth closed and breath only through your nose. Your breaths should be rapid and each inhale and exhale should be equal in duration. With practice, you should have three in-and-out breath cycles per second, followed by a normal breath. This is a quick exercise and should only be used for a few minutes at a time. If at any time you feel lightheaded, you should stop the bellows breathing and resume normal breathing. 4-7-8 breathing is a popular breathing exercise that is helpful to use when trying to fall asleep. This exercise can be done from a seated position or while lying down. Close your eyes and begin with an inhalation through your nose for a count of four and hold your breath for a count of seven. Lastly, exhale through your mouth as completely as possible for a count of eight. Continue to repeat until you fall asleep. If you are practicing for stress relief, it is best to be in a seated position and should be done at least twice a day. In this exercise, you do not increase the breathing times, always hold for the counts of four on the inhale, hold for seven, exhale for eight. Alternate nostril breathing is a more advanced exercise. It is a popular yoga technique that promotes calm and balance by uniting the both hemispheres of the brain. Start in a comfortable seated position with your spine erect, shoulders relaxed and eyes closed. Place your left hand on the left knee, with your palm facing up. Then by using your right hand, position your middle finger and index finger of the right hand between the eyebrows, your little finger and ring finger on the left nostril, and then place your thumb on the right nostril. Inhale through both nostrils, then begin by pressing your thumb down on the right nostril and breathe out gently through the left nostril. Breathe from the left nostril and then pinch the left nostril softly by using your ring finger and little finger while removing the right thumb from the right nostril. Exhale from the right, then breathe in from the right. Now, make sure to close the right nostril as you release the left and breathe out from the left. Continue inhaling and exhaling by alternating between the left and right nostril. Repeat until you feel comfortable and you should find yourself focused and energized. The best part about fighting stress through purposeful breathing is that you can use these techniques anywhere and at any time. You may choose to focus on one of these techniques, or you can try all of them. The key is to practice at least one technique every day. Remember that you can be stressed or you can focus on your breath. Let go of your stress, and choose to be happy.